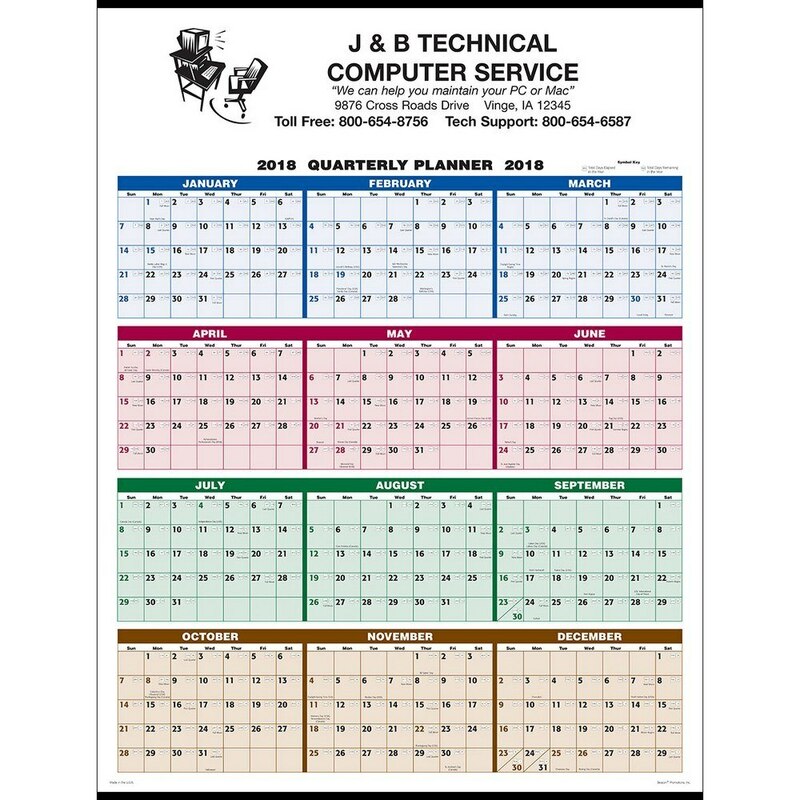 The Single Sheet Wall Calendar in 4 Colorgives you the Quarterly Full Year view at a glance making it easy to plan events and meetings. Each quarter is color coded for easy reference with symbols highlighting the days elapsed and days remaining. 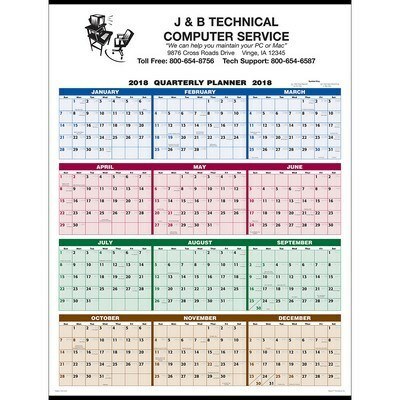 The Single Sheet Wall Calendar in 4 Colorgives you the Quarterly Full Year view at a glance making it easy to plan events and meetings. Each quarter is color coded for easy reference with symbols highlighting the days elapsed and days remaining. This calendar printed on 80lb matte paper has all the US Federal holidays and Canadian National holidays marked neatly to make quarterly plans for campaigns and events. Your logo and company design will be imprinted right at the top centred above the months giving it unmatched brand visibility. This quarterly planning calendar is tinned at the top and bottom with a convenient loop for hanging. This is a great giveaway for hardware and lumber stores, painters, roofers, carpenters and several more. Your customers will remember you and your products and services all year long. Get your company logo and information imprinted in the 21" (w) x 4-3/4" (h) imprint area centred between the tinning and promote your brand in a professional way.